Metso has been recognized as the best Scrap Equipment Provider of the Year by American Metal Market. The recognition was granted for the best-in-class performance and announced at the AMM Awards 2017 for Steel Excellence, in New York, United States. American Metal Market's Awards for Steel Excellence is one of the most prestigious and recognizable awards programs for the global steel industry. Metso was honored, in part, because of special attention to helping customers improve operational efficiency and environmental stewardship with sustainable solutions. 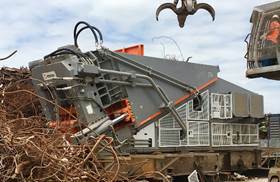 "Metso's product offering for metal recycling is among the most comprehensive in the industry. Through our LindemannTM, Texas ShredderTM and N-SeriesTM product lines, we offer a full range of pre-shredders, automobile shredders, shears, balers, and briquetters, along with complete capability for developing custom solutions for our customers' ferrous and non-ferrous scrap processing needs," says Keith Carroll, VP, Metso Metal Recycling, Americas. Recently Metso increased the number of personnel in North America to put together arguably the most experienced and knowledgeable sales staff in the region for metal recycling products and services. "Members of Metso's recycling organization have performed and excelled in varied backgrounds, including engineering, field service, shredder operations, product development, sales, and management. They continue to be backed by an experienced product management, sourcing, distribution, and field service organization," Carroll says. Metso Metal Recycling offers a wide range of efficient solutions for the fragmentation, compaction and separation of virtually every type of metal scrap. Our customers range from large multinational scrap yards and leading players in the automotive industry to steelworks and local family-run scrap yards. Metso's solutions are designed with state-of-the-art technology and the highest safety standards to help drive sustainable improvements in performance and profitability within our customers' businesses.